How being called ‘the world’s ugliest woman’ transformed one woman’s life – and inspired millions of others. 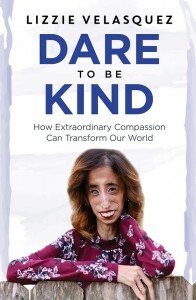 Because of a rare genetic condition, Lizzie Velasquez has dealt with harassment about her appearance for most of her life. In 2007, the rise of social media led to her most public and humiliating experience: a then 17-year-old Lizzie came across a YouTube video of herself entitled ‘The world’s ugliest woman’. Lizzie started using the very medium that spawned this hatred to fight back and spread positivity and compassion instead. ‘The only way I could show those people that they weren’t going to become my definition and my truth was to somehow make myself better’. Her response drew 34 million unique viewers and half a million subscribers to Lizzie’s YouTube channel. She catapulted to international fame in 2013 when her TEDx address ‘How Do You Define Yourself?’ went viral. Today it has received more than 10 million views. In Dare to be Kind Lizzie shares her personal story, the solutions that have worked for her over a lifetime of bullying and on how we can transform society into a kinder, more accepting place. This book will be an invaluable resource for anyone facing bullying, their parents and friends – and anyone who wants to make a difference.